People with mobility difficulties, dementia or cognitive impairment are likely to struggle with many aspects of daily living. There are many products to make daily living tasks easier and safer. Many of us look for comfortable or wide fitting shoes and slippers and we have covered this in our Shoes and Slippers section where we are a listed stockist of Cosyfeet products. Getting dressed can sometimes prove difficult and there are many dressing aids available to assist such as stocking aids, button hooks, long handled grooming aids etc. 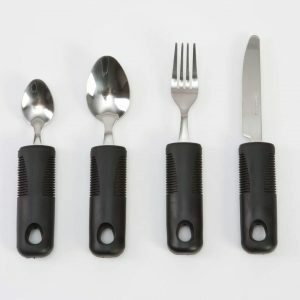 There are a huge range of Daily Living Aids available to assist in the kitchen, bedroom, bathroom, living room, eating and drinking. H&M have a vast range of Daily Living Aids both instore and available through our selective range of quality suppliers. Our highly trained friendly team are here to help you choose the right product to meet your needs.